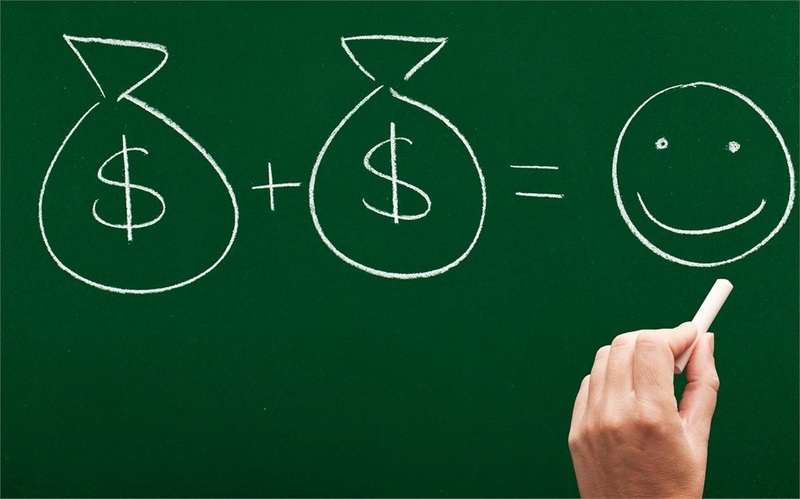 It is a question people have been debating about for some time…can money buy happiness? And while responses vary greatly, recent study data shows we might be closer to finding the answer. 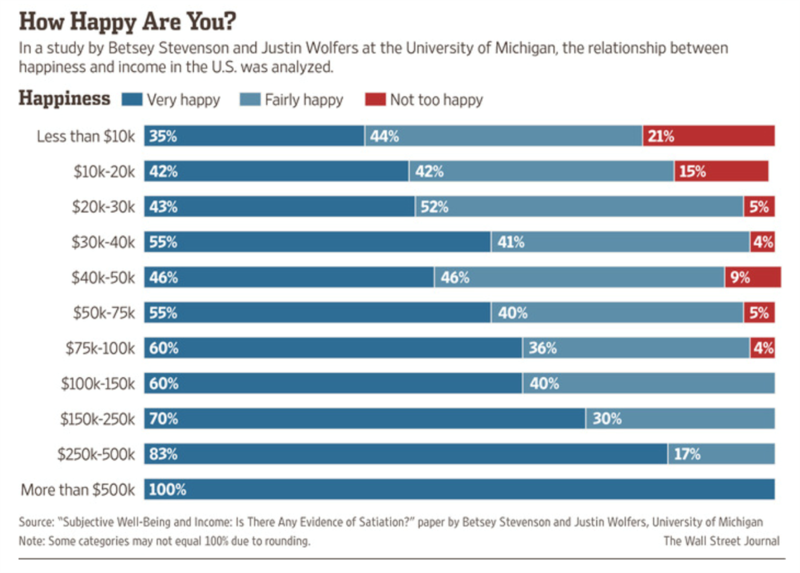 Money may in fact make some of us happier, depending on how it is spent. Recent research regarding money spent on experiential purchases and time-saving purchases highlight high rates of post-purchase happiness. The study Buying Time Promotes Happiness, recently published in the journal Proceedings of the National Academy of Sciences, took a closer look at the busyness of people’s lives and how “buying time” could increase levels of happiness. Of those interviewed, less than a third used their money to help free up time, but that group of people stated higher levels of satisfaction and happiness in life. Americans in the study who fell into this group reported increased levels of happiness by .77 on a ten-point scale over those who did not make time-saving purchases. Part of the survey also involved an experiment of 60 of the participants. Each person was given $40 to use on a time-freeing purchase. Then they were given another $40 to use on a material purchase such as clothing, décor or books. After both purchases, participants were asked to rate their happiness level post-purchase on a five-point scale. The result? 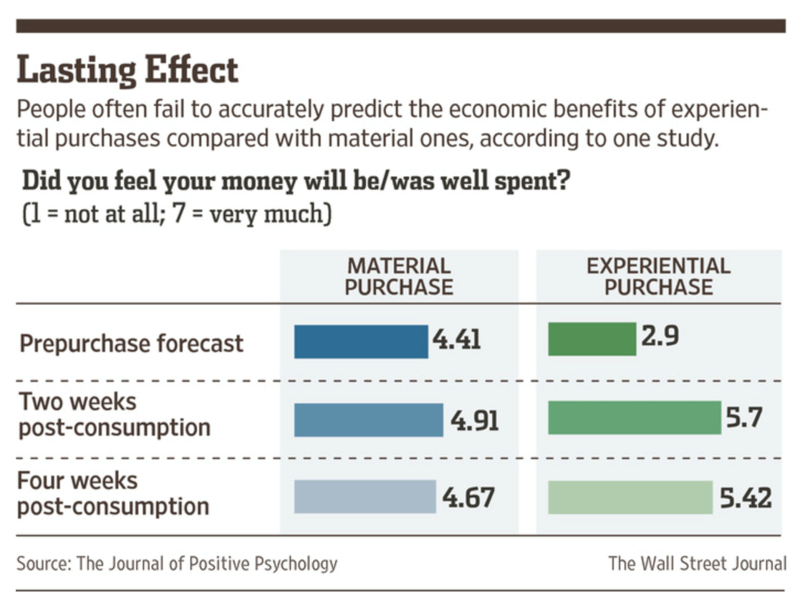 Material purchases averaged 3.7 whereas time-saving purchases landed at 4.0, a small but noticeable difference. While more research needs to be completed on why only a small percentage of people will typically spend their money on time-freeing purchases, the theory surrounding this behavior has more to do with guilt and tradition. Many people feel it is their duty to prepare their own food, clean the home, do laundry, rather than have someone do it for them. According to Thomas Gilovich, psychology professor at Cornell, many people will have the initial excitement for traveling to a destination, but feel the experience would be fleeting vs. purchasing a material item. Experiential purchases however have been shown to provide a great sense of connection to the world around us, and can form a large part of our identities. Plus, studies found people are less likely to compare each other’s experiences as they are to compare each other’s “stuff” which can lead to less stress and feelings of inferiority. So how much happier can an experiential purchase make someone over a material purchase? According to a recent study from The Journal of Positive Psychology, four weeks after the post-consumption of a material purchase, respondents rated their happiness at 4.67; after an experiential purchase, happiness levels were rated at 5.42 (on a 1-7 point scale), a small but substantial increase. It seems a combination of spending money on time-freeing purchases and experiential acquisitions are in fact increasing people’s level of happiness. So what are you spending your money on? Is there a journey or experience you have always dreamed about? And how can you implement time-freeing purchases into your life? Would a personal shopper, cook or housekeeper free up a substantial block of time for you to spend on a hobby or with a significant other? Let a financial advisor help you create a plan to make those experiences or time-saving purchases happen in the near future. Reach out to www.MattLoganInc.com to learn more.